The equipment is unused surplus from the manufacturer. They come with the manufacturer C.O.C. The equipment is in a yard located outside of Houston, Texas. All items are, "AS IS", "WHERE IS". Buyer is responsible for logistics and freight. 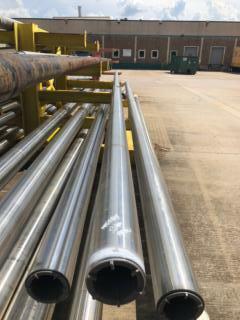 This lot of Non Magnetic Drill Collar (4-3/4" OD, 30 ft Length, 3-1/2" IF Connections) is available for sale by the manufacturing company as it is no longer required for daily operations. The equipment is unused surplus and comes with manufacturer COC.